Acquire was designed by Sid Jackson and published in 1964 as part of the 3M bookshelf series. Produced from the early 1960s through mid-1970s, 3M’s games were a bit of an oddity outside their core office, medical and industrial supplies business yet they hold a solid place in the hearts and history of the gaming community. Along with classic board games like Go, Backgammon and Chess, the 3M bookshelf games also introduced the early trivia game Facts In Five, the election-themed Mr. President and economic strategy games like Acquire. In 1976, the 3M games were sold off to Avalon Hill which was subsequently purchased by Hasbro in 1998. 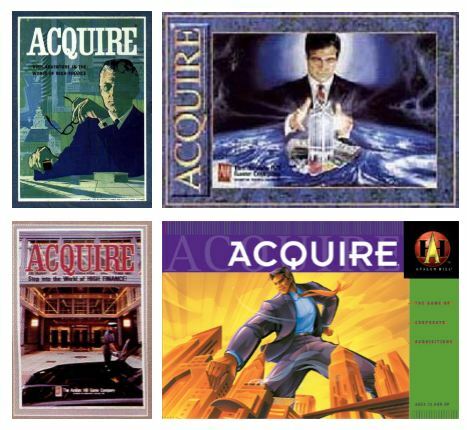 The chain of ownership of Acquire through the years made for multiple international editions as well as a more recent period of the game being out of print until Hasbro’s Wizards of the Coast made the game available again in 2008. 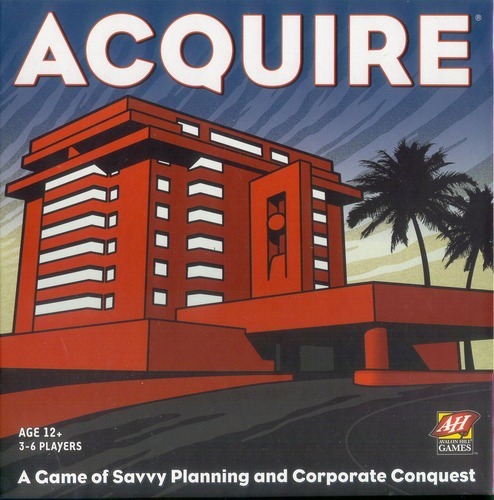 For a game based in the economic mechanics of buying and selling, Acquire itself has passed through several acquisitions itself over the past five decades. I had a chance to play the modern incarnation of this venerable game on a recent weekend at Metropolitan Wargamers in Brooklyn, NY. The latest edition of Acquire consists of relatively underwhelming card stock and paper components that is short on charm but does keep the price just under $30. The game board presents a grid of building lots marked with a number and letter combination which coincide with a set of tiles with the same markings. 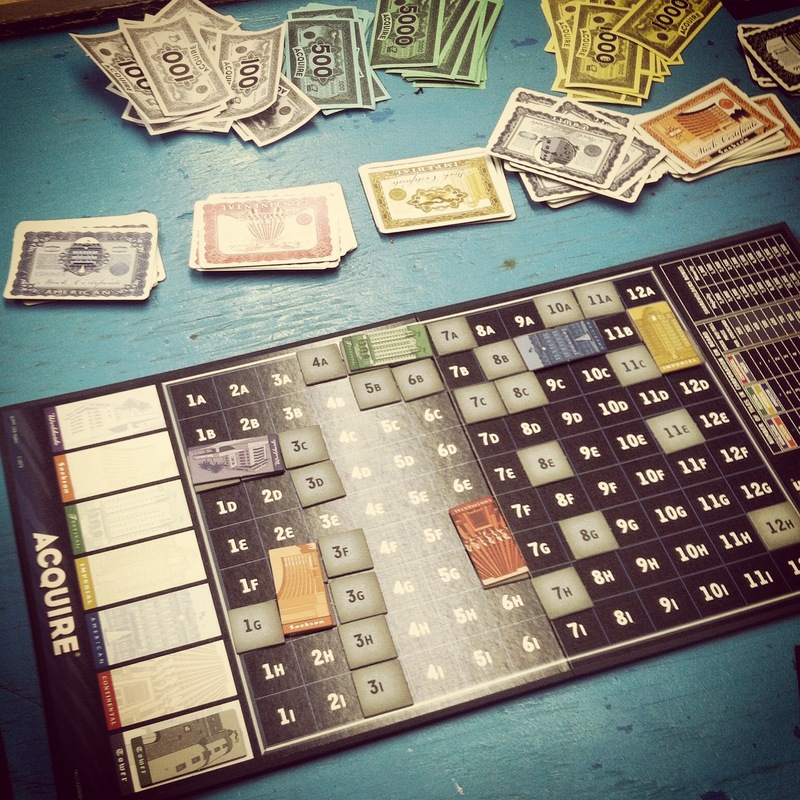 In turn, players play tiles and may opt to construct an available corporation once two contiguous lots are available. 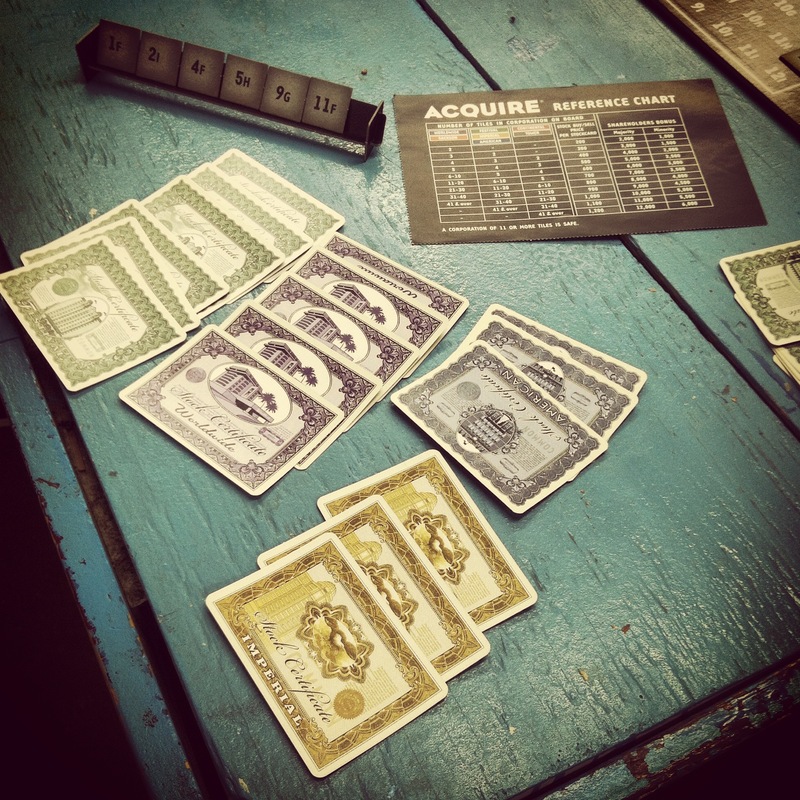 Constructing a new corporation gets the player a free stock certificate plus the opportunity to buy up to two more shares at the starting price. On a turn where a new corporation is not being founded, a player may instead buy up to three shares total among the existing corporations. As chains of tiles are built out, the value and cost of a stock rises. Over the course of the game, existing corporations expand and larger corporations merge with smaller ones once their chains of building lots intersect. When corporations merge, players with stock may cash out, convert shares at two to one for the new coronation’s stock or hold the old stock for when (or if) the gobbled up company finds a new space to start again on the board. Once a corporation grows to a chain of eleven tiles it becomes safe from a take over, and the game ends once every company reaches at least eleven tiles in size. Stocks are cashed in and money is counted to determine the winner. Acquire’s staying power rests in its simplicity coupled with a lot of strategic and tactical play mirroring something like actual investing. As in the real world, timing, location and having cash on hand to strike when an opportunity presents itself are all key factors in Acquire. The game is also almost purely competitive, and the rules as written offer no opportunity for side trading or off-board deals. Placing a tile is usually a direct benefit to the player or may be a defensive move against another player’s expansion. Swooping in to buy stock to become a majority shareholder right before a merger can cut someone else out of a hefty payout. A merger or expansion of existing companies may also benefit multiple players. The ability to quickly convert cash earned into a new investment and then flipping that into more profit rules the game. While the modern incarnation of Acquire pales next to past editions with their better components, the game itself remains strong. The buy-sell cycle of investing hasn’t changed much over the years. For a game with a fifty-year history of itself being bought and sold, little has changed with Acquire either.